The production process starts with the overturner bins that empty the crates containing the citrus fruits onto a conveyor belt that removes the leaves. A washing system is positioned above and consists of high pressure jets of water. 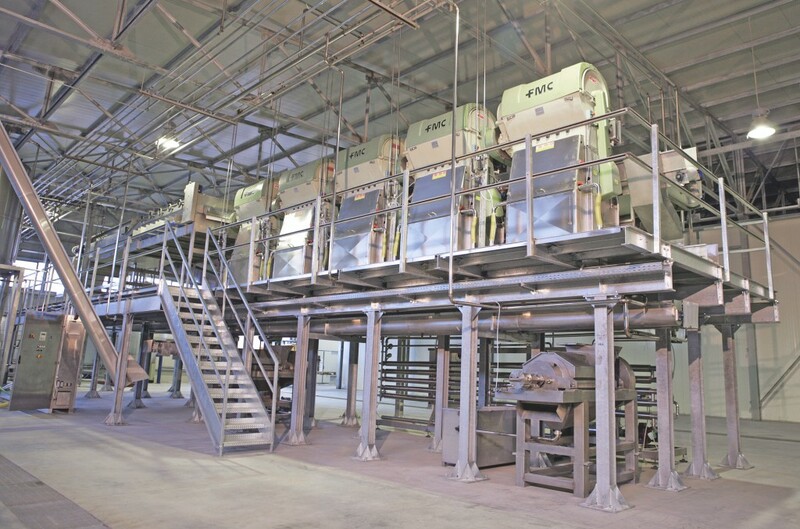 The washed citrus fruit, now without leaves, are sorted manually by two operators who direct suitable fruit to be processed which are lifted up to go through further washing station where they are brushed and washed again with high pressure jets. Before the citrus fruit arrive at the extraction line, they go through a size calibrator. There are 3 sizes: diameter up to 60 mm; 60 mm to 80 mm diameter; and 80 mm to 100 mm diameter. After calibration the citrus fruits are conveyed to the extractor feedboxes through three distribution channels according to size on an inclined belt. Excess fruit fall onto a return belt below and are brought back to the calibrator by an elevator belt. After extraction the juice is channelled into a tube and sent by gravity to the juice finisher to reduce the pulp content. 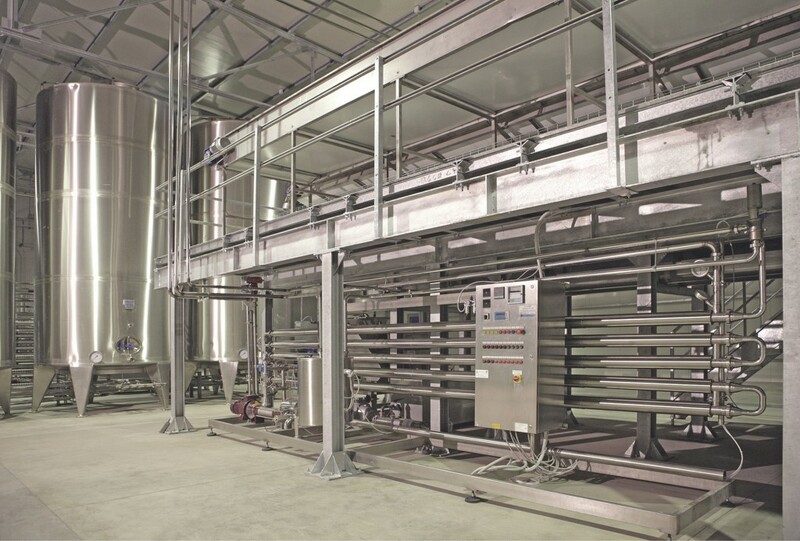 It may then be pumped to a chiller – where the temperature of the juice is lowered from 20°C to 5°C – passed through a 25 mc silos and then put into drums or alternatively loaded into bulk tanks. Before placing the juice in the temperature maintaining cell, it passes through the two freezer tunnels, where it undergoes thermic variation – in 36 hours – of -23°C; arriving at a final temperature of -18°C, before being placed maintaining cell where it is kept until being sent. 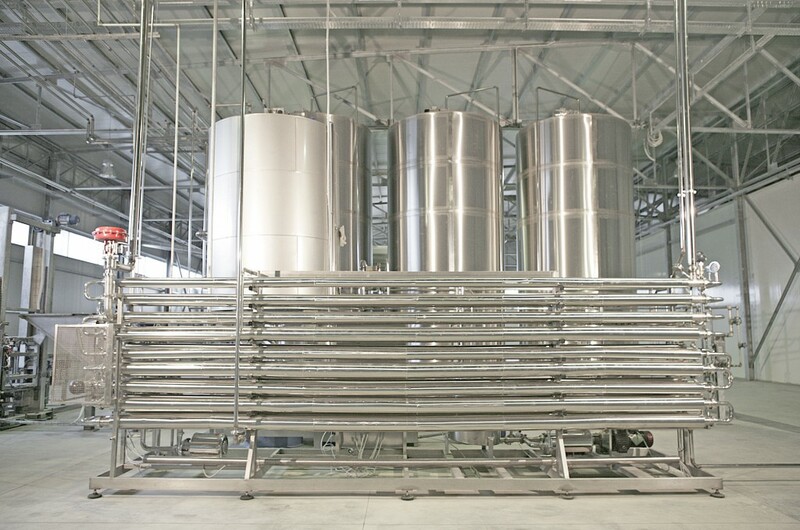 In the processing line there is a crusher followed by a pasteurizer here the juice reaches a temperature of 90°C before leaving at a temperature of 2-4°C. The peel and the residue of the extraction process are collected by a conveyor and sent to the peel silos, from where they will be loaded onto a lorry and transported to an authorized dump. For the recovery of essential oils, in the exterior part of the fruit in the extractor is sprinkled with jets of water which take away the essential oils. The mixture of water and essential oil together with any debris, are collected by a conveyor which sends them directly in an essential oils finisher, which eliminates the solid particles. A pump sends the emulsions to the silos which feed a primary automatic centrifuge. This eliminates most of the water, while the rich essential oils mixture is sent to the second automatic centrifuge, where there is a final separation of the essential oils; they are then stored in a freezer cell at 0°C. The water from the automatic centrifuge passes therefore through a three section decanting tank and from this by pump to a static filter to eliminate the smallest solid particles and send them back again to the extractor to restart the cycle. The processing line is supported by a purifying plant described below which has the capacity for purifying all the factory waste water and so reduce COD to almost zero and furthermore to reduce the parameters considered dangerous for the discharging of water that would happen at the industrial zone purifier.